Which world is better to live in, virtual - with its limitless self-expression possibilities, and a chance to be whoever you want, or the real one, with like trees and stuff? That’s a modern philosophical puzzle, our day’s version of “which came first - chicken or egg” dilemma. There are tons of supporters of each answer. However, the phrasing of that question is wrong - virtual reality isn’t separated, it’s just a part of the real world - and you’re supposed to treat it appropriately, as an addition to your active living - not as a substitute for it. I got carried away, I know, so now let’s apply my awkward attempts to seem smart to e-Commerce, and, particularly, to marketing. If you’re a physical store owner who also sells online, the topic I’m about to bring up is vital for you. So, here goes - is it a good idea to replace all advertising with just online campaigns, because Internet has got so huge? Noo, that’s just a part of it, remember? You’re supposed to combine both online and offline advertising to get maximum results - to increase sales in both physical store and online. TV, papers, radio, billboards - such marketing tools still bring fantastic ROIs, and many successful companies are well aware of it. 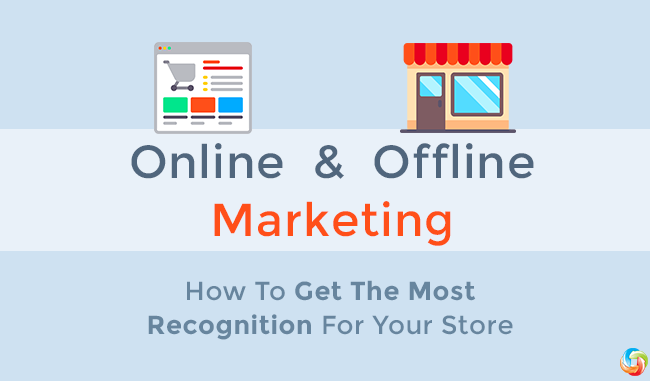 The brilliant infographic from Colourgraphics explores how prosperous companies use online and offline marketing simultaneously, to get the most profits and recognition. Enjoy! A current plethora of online and offline marketing options allows you to cherry pick. So, learn from the greats - see which advertisements techniques are successful companies excited about, and apply them for your retailer. Good luck with your business.